"Protection of the organism against aging phenomena. Depressive syndrome, in precocious stages, when conventional therapy it has contraindications." It is a medicament elaborated by the Romanian scientist Prof. Dr. Ana Aslan, together with her collaborators and disciples, as a result of their researches concerning procaine effects on the organism. The product has been used for many years, as well as it is today, for treating thousands of patients all around the world and at the National Institute Gerontology of and Geriatrics in Bucharest, that nowadays received the name of the famous Romanian lady. GEROVITAL H3 is a procaine-based medicament for adults and elderly people. Researches made by the Romanian gerontologists showed that GEROVITAL H3 has an eutrophic effect on the organism as a whole, prolongs the active life span, delays onset and ameliorates the symptoms of age related diseases. 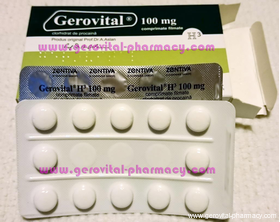 The Romanian original product GEROVITAL H3, is manufactured after the Ana Aslan's formula by the pharmaceuticals producer - ZENTIVA N.V.
-Excipients: maize starch, mannitol, gelatin, talc, magnesium stearate, sugar, povidone K30, sodium carboxymethylcellulose, -colloidal silicon dioxide, titanium dioxide, schellack, yellow wax, carnauba wax. -Depressive syndrome (light and moderate depression), in precocious stages, especially when conventional therapy is not well-tolerated or it has contraindications. -Parkinsonian syndromes - where it can be used in monotherapy or associated with other antiparkinsonian drugs, especially with dopaminergic agents. -Systemic arteriosclerosis with hypercholesterolemia, ischaemic heart disease, arteritis, cerebral atherosclerosis. -Hypersensitivity to procaine in antecedents or tested. -Associated treatment with sulfonamides (except the antidiabetic ones) and with acetylcholinesterase agents: neostygmine, eserine (physostigmine) and pyridostigmine. -The treatment must take place under medical supervision, mainly in the first series of treatment, in order to establish the optimal dose. -The product should be administered with caution in patients with orthostatic hypotension. -Although procaine medication is not carcinogenic, it is not recommended to the patients with cancer, as its stimulating effect on mitotic potential of the neoplasic cell is not excluded. -Gerovital H3 should not be administered simultaneously with sulphonamides (antagonistic mechanism of action) - except the antidiabetic ones, anticholinesterases: neostygmine, eserine (physostigmine) and pyridostigmine. -The studies on animals did not show teratogenic effects. In absence of teratogenic effects on animals, malformative effects on humans are not expected. However, the clinical experience with Gerovital® H3 is mainly on patients over the procreation period. For these reasons we do not recommend the use of the product during pregnancy and lactation. -The product does not interfere with these abilities. Before starting the treatment with Gerovital H3 it is compulsory to test individual sensitivity to procaine, as follows: 1 ml from the injectable solution of Gerovital H3 will be administered subcutaneously and after 24 hours the test should be repeated with 1.5 ml solution intramuscularly. If any allergic reaction occurs, the treatment is not recommended. Injectable solution: 1 intramuscular injection, 3 times a week (one ampoule every other day), over a period of 4 weeks (12 ampoules). Sugar-coated tablets: 2 sugar-coated tablets/ day, after meals, in the morning and in the afternoon, for 12 days. Series of injections and sugar-coated tablets should be alternated yearly, continuously or with one-month pause between them. The schedule and the frequency of pauses will be decided by the geriatrist, according with the aging status of the patient. - 4-th week: 2 ampoules i.m., 3 times a week. -Daily administration of 1 ampoule i.m. and two sugar-coated tablets, for 15 days. -1 ampoule i.m. / day, for 15-21 days and then 1 ampoule i.m. 3 times a week (every other day), for 4 weeks, repeated of 4-5 times /year. During the pauses in injections series, 1-2 sugar-coated tablets/ day, 12-18 days / month, can be administered. -Depending of the intensity and the localization of the process, the treatment should be as follows: 1 ampoule i.m. / day, 3 times a week, 4 weeks (12 ampoules), repeated 5-6 times /year. In some cases the treatment can be exclusively oral: 3 sugar-coated tablets/ day, 21 days in 6-8 series / year. Administration of Gerovital H3 may produce allergic reactions in patients with hypersensitivity to procaine like skin rash or pruritus. These effects impose an immediate stop of the treatment. Minor effects may occur especially at the beginning of the treatment like: dizziness, weakness and palpitations. These effects can be avoided if after the injection the patient rests in bed for 10-15 minutes. There are no reports of overdose related to administration of Gerovital H3. In case of accidentally injection of high doses, severe hypotension, convulsions, coma, respiratory arrest may occur. -Store below 25 degree C.
-Keep the recipient tightly closed. -Keep out of the reach of children. -Do not use after the expiry date printed on the package.